A 3 year old male was jumping in his bed. He jumped one time too many and landed on his dresser, hitting his chin and biting his tongue in the process. He then ran downstairs and bloodied the carpet. Mom grabbed a towel sopped up some mouth blood, then scooped him up and threw him to the ED. The bleeding is well controlled, he is only in mild pain, and it does not go through the tongue completely. He had just eaten some chicken nuggets, so he’s not remotely NPO. What do you do? Which tongue lacerations do I need to repair? How do I repair them? You also need to control the tongue and keep it protruded. 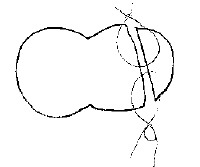 This can be accomplished by grabbing the tip with forceps, or by placing a large (3-0, 2-0) suture thorough the tip. There is no consensus on how many layers to repair with. Copious irrigation without drowning the patient is important. Certainly length of the procedure is an issue for younger/sedated patients, but you also want the sutures to stay in place as they can become untied due to the normal movements of the tongue. Therefore it is important to use absorbable sutures (I like 4-0 chromic gut) and bury the knots in the tongue itself if possible. In general my biggest concern is getting the sutures to stay in place – so I’ll do 2 or 3 layers. The first is placed as a loop with the knot buried in the deep muscular mucosa. I’ll then suture the lateral edge. It is OK to leave the knot outside the tongue if it is on the lateral side. eMedicine has some seriously great videos that you should check out. The patient should be discharged on a soft diet for 2-3 days, and encouraged to do peroxide/chlorhexidine mouth rinses after eating. Specific follow-up is only necessary for poor healing wounds, or those that lead to problems with speech or eating. Antibiotics are not necessary. Can I do something other than suturing? A recent report was published on the use of Dermabond to repair a tongue lac in a patient that the parents did not want local anesthesia. I didn’t think about this before but it seems as though it would hold long enough for the tongue to heal. Check it out here. How can I practice suturing a tongue lac? I was thinking about this one a bit and I came up with a potential conference idea that involves getting some suture material and going to the meat store for some beef tongue. Good analysis. There is so little consensus about tongue lacerations and I think you have done a very good job of demonstrating the ones that need suturing and those that don’t. I am a paediatric surgeon working in Kolkata India. For very long. My problem is convincing parents that the tongue will heal. Some are relieved to hear it and others just go and find a surgeon who will operate. Going to use your blog to show parents. Thank you. Thanks Sharon – this is a tough topic to discuss with parents since these bleed so profusely. Repair is also very challenging both technically and from a pain/sedation standpoint.